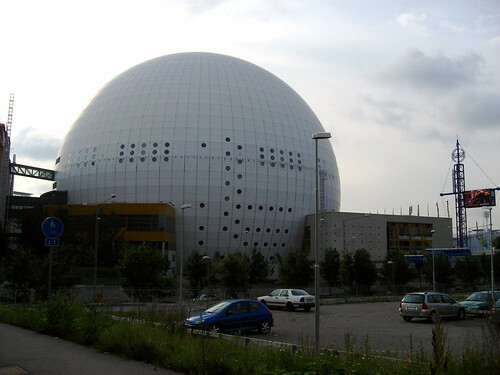 The national indoor arena of Sweden popularly known as Globen (meaning: "The Globe") is the largest hemi-spherical building in the world. 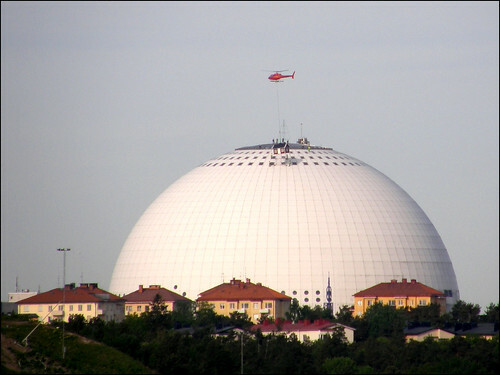 Shaped like a giant ball, it has a diameter of 110 metres, overall height 130 meters (inner height 85 metres) and total volume of 605,000 cubic metres. 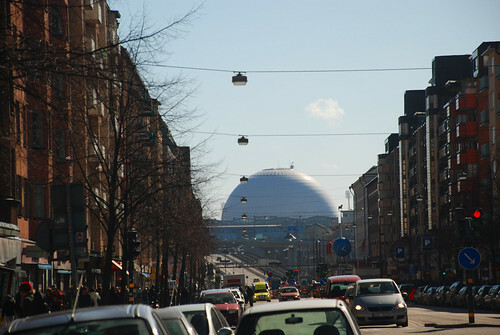 Originally known as Stockholm Globe Arena, its naming rights were acquired in 2009 by Swedish telecom giant Ericsson and it is now known as "Ericsson Globe". 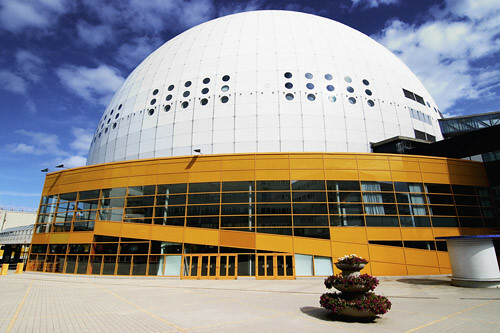 Inaugurated on February 19, 1989 it was mainly built for ice hockey, however it is also used for cultural programmes, concerts and other sports events. It has a seating capacity of 13,850 for ice hockey and 16,000 for other events. On May 26, 2009, a traditional Swedish red cottage with white corners (called stuga by Swedes) was placed on the Globe for a short period of 5 months. 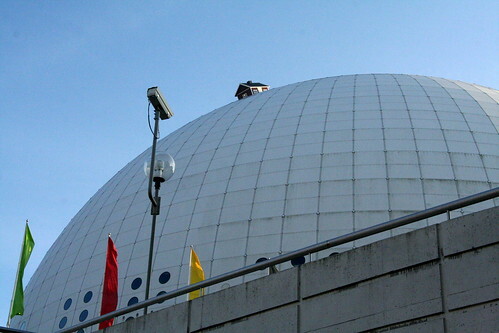 The stuga created by the artist Mikael Genberg was meant to depict the Swedish high-technology of the Globe's structure as well as the simplicity of traditional small stugas in their countryside. The artwork was also symbolic to a larger project which intends to place a similar stuga on the Moon in 2012. 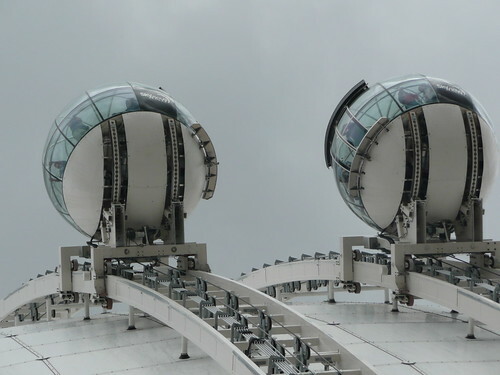 Since February 2010 the top of the arena can be accessed by means of a funicular railway known as "Skyview" whose two transparent carriage cars are also built in the shape of Globe. 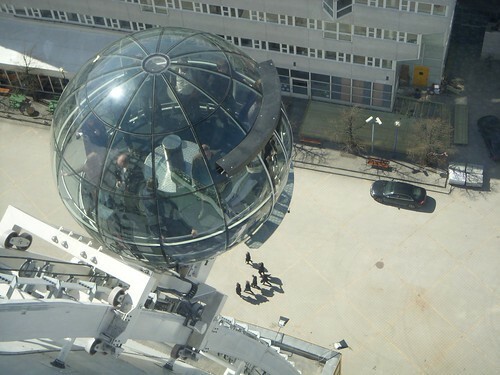 The top of the Globe provides a panoramic view of Stockholm. More info on stugas can be read in "Mikael Genberg and his stugas" posted by Noisette, Master Guide, GEC Forum.